SOULsquads are groups of roughly 10 girls who are passionate about building confidence, and being involved in making change. SOUL identified the need for this programme after girls from all over NZ started contacting us. They felt they had so much to say, but didn't think anyone was listening. Through the SOULsquad programme we're affirming that SOUL and their school DO care about what they have to say. 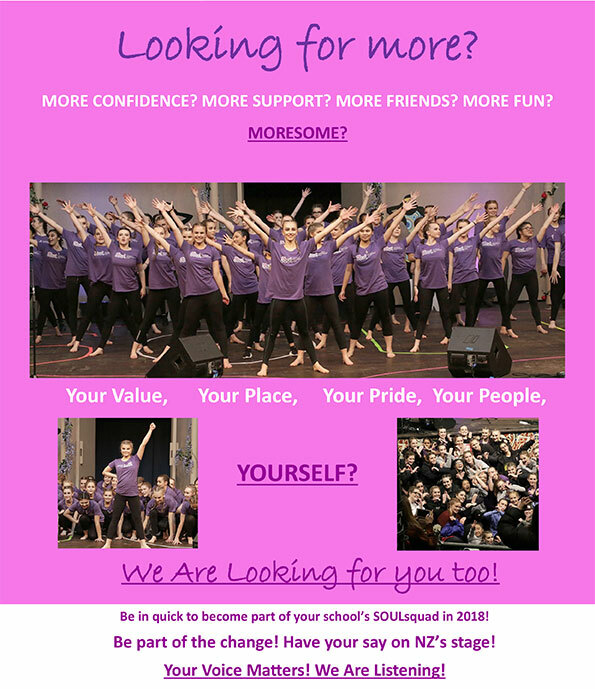 We believe in it so much, we are ready to put them on stage to say it!Girls involved in SOULsquads can create a SOULsupersquad of up to 40 girls who wish to take part in Voice Of Our SOUL – our annual performance that addresses SOUL’s key themes. While SOUL gives guidance about the performance and offers the girls professional support – such as voice training and choreography – the girls write and perform themselves. We design the performance to be an outlet for girls to express their true selves while making lifelong friendships. • Become SOUL certified! - Earn a certificate that you can add to your CV which affirms your passion and commitment to improving the lives of NZ girls. • Be accepted into our ever-growing SOUL Sistahood! We’re a network of girls from across New Zealand committed to helping each other succeed. • Be part of a movement that creates real positive change. In SOUL programmes, girls form deep, trusting friendships they never thought possible, find confidence they didn’t realise they had, and make life choices they previously never dreamt of; in short, they find the power to be themselves. We welcome and encourage membership in both SOULcircles and SOULsquads. Any girl enrolled in a SOULcircle is also welcome to join or start a SOULsquad at their school. Contact us for more information about SOULsquads. Step 1: Register your interest and secure your spot by clicking the button above.Step 2: Fill out and return the registration form we send youStep 3: Ask your Parents/Guardian to sign if under 18.Step 4: Join your SOULsistas and begin your journey! Voice of Our SOUL is SOUL’s annual event where the SOULsquads perform their performance pieces they created and practiced during the first half of the year. Last year the event was held at the Pop-Up Globe theatre in Ellerslie. It included guest performances by Valkyrie, Renee Maurice, and Tone6, and NZTV's Erin Simpson MC’d the event. The girls performed in front of an audience of parents, friends, and sponsors, and reviews called it an "inspiring and magical evening." SOUL offers the SOULgirls performing in the event: transport to the venue, professional hair and makeup, and dinner prior to the show. We treat the girls like the stars they are and help them to shine! But don't take our word for it – experience Voice Of Our Soul for yourself!